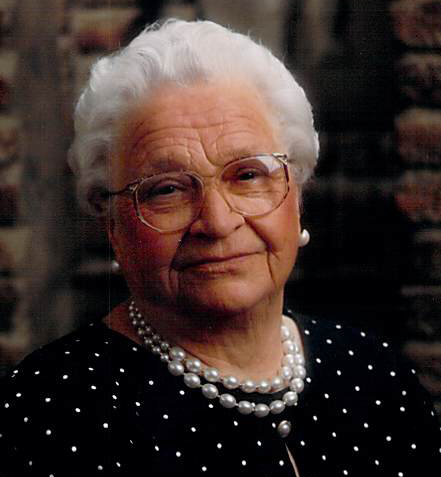 We lovingly remember our family matriarch, Anna Jahn, who passed away November 27, 2018 at the age of 96 in Lethbridge, Alberta. Anna, the eldest of 10, was born on February 24, 1922 in Josefstal, Ukriane to Daniel and Katharina Geworsky. In 1940, she met and married William Neuberger, also of Josepstal, and gave birth to a daughter, Lydia, in 1942. War forced the family to flee to Poland and on to Germany where her husband was drafted in 1944 and was subsequently lost in action in 1945. After the war in Germany, Anna met and married Karl Jahn. Karl and Anna had two children, Peter in 1947 and Lisa in 1948. A third child, Irene was born in 1954 after the family immigrated to Canada for greater opportunity. Their first years were hard, but Anna believed the Lord was with them and guided them so that no one was lost from the road of life. Anna always gave thanks for their blessings. As a long-time resident of Coaldale prior to her residence in Lethbridge as her health declined, Anna was a faithful member of Redeemer Lutheran Church and was active in its groups for as long as her health allowed her to make that regular attendance. In her latter years, she attended various services at the lodges, maintaining her communicant membership with Redeemer Lutheran and always having daily devotions in her room. Throughout her life Anna was very keen in her gardening and received many ribbons, which she proudly displayed in her room. She was always happy to receive a visit or a phone call from her children, grandchildren and even great-grandchildren. Visits from the small children brought a happy smile to her face. Anna was a homemaker, and always shared whatever she had to give – so if you got some baking or pickles count yourself as special in her heart. Anna and Karl enjoyed entertaining and hosting and did so for many local and foreign visitors. They had fond memories of their first overseas trip to Hawaii, and Anna made the journey back to Germany many times throughout her life to visit family. She loved her vacations to Radium Hot Springs, many times inviting friends and family to join them, a tradition the family enjoys to this day. Anna was pre-deceased by her husband, Karl in 1988 and daughter Lydia in 2012; her father, Daniel in 1980 and mother Kathrine in 1989; a brother Johann in childhood; brother, Wilhelm lost in action in 1943; brother Erwin in 1997 and sister-in-law, Marilyn in 1988; brother Emil in 2012; sister Louise in 2014, sister-in-law Marie in 2018; brother-in-law Erwin in 2009; and 2 grandchildren in infancy. She is survived by 3 children, Peter Jahn; Lisa (Marvin) Mack; Irene (Craig) Ryckman and sons-in-law Sam Wagner and Frank Riha; daughter-in-law Karen Hanna; 12 Grandchildren Andrew (Colleen) Wagner; Mark (Tina) Wagner; Robert Wagner; Leslie (Darcy) Tolnai; Kirk (Lyanne) Riha; Joe (Carolyn) Riha; Kristy (Robb) Jahn-Smith; Michael Jahn; Erika (Jennifer) Scott; Chad (Lindsay) Ryckman; Brad Ryckman and Derek (Hailey) Ryckman; siblings Daniel (Ellie) Geworsky; Johann Geworsky; Fred (Sylvia) Geworsky; Lydia Guse; sister in law Olga Geworsky and Susan Geworsky; 18 great-grandchildren; and 7 great-great-grandchildren; along with many neices, nephews, and cousins. What a legacy has been left to live on and remember her. A Funeral Service will be held at 1:00 PM on Saturday, December 8, 2018 at MARTIN BROTHERS RIVERVIEW CHAPEL, 610 – 4 STREET SOUTH, Lethbridge, AB. Interment to follow at the Coaldale Cemetery.